BUENOS AIRES, Mar 10 2016 (IPS) - In Argentina, there are now 20 brand names that guarantee that their garments are produced by workers in decent working conditions, thanks to the Clean Clothes network, aimed at eradicating slave labour in the garment industry, which illegally employs some 30,000 people in sweatshops around the country. The members of the 20 de Diciembre Cooperative stop for lunch, and leave work on time after a seven-hour workday, to go and pick up their children at school. These rights are supposedly guaranteed by local laws. But they are not respected in around 3,000 sweatshops in Greater Buenos Aires, which account for 80 percent of the local garment industry’s output, according to statistics from the La Alameda Foundation, which was behind the creation of the cooperative. “They only gave us one plate of food, which we had to share with our kids. 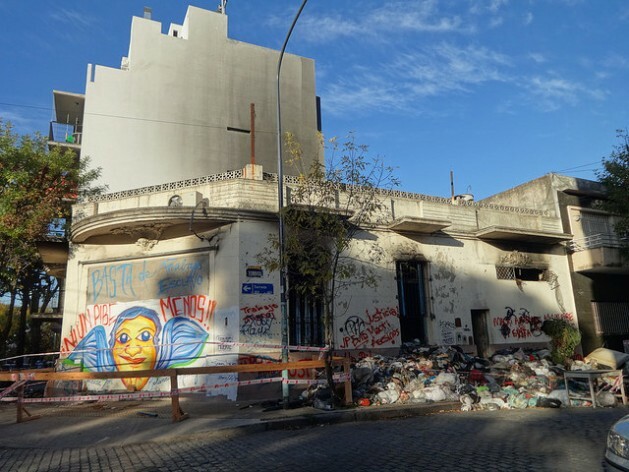 And the food wasn’t good,” Susana Chiura, a member of the cooperative who came to Argentina from Bolivia seven years ago, told IPS. Like many other South American immigrants in Argentina, many of whom are from Bolivia, Chiura was brought in by the owner of a textile workshop, who in this case was from Peru. She shared a tiny room with poor ventilation with her oldest son. She earned five times less than the minimum wage required by law, working from 6:00 in the morning to midnight. And the cost of the trip from Bolivia, meals and lodging were docked from her pay. “Now I have more time to play with my kids. Before, they’d be sleeping when I left in the morning and they’d already be asleep when I got home,” he told IPS. According to La Alameda, workers like Chiura or Daza are the last link in a chain that starts out with large, medium and small clothing companies which, due to omission, complicity or ignorance, use sweatshops to manufacture the garments they sell. Her firm is one of the cooperative’s clients and forms part of the Clean Clothes network, which also groups garment factories and consumers. She said many designers turn to sweatshops to cut costs or because they don’t really understand what’s going on. The Ropa Limpia or Clean Clothes network emerged in 2015, with a successful fashion show held to demonstrate that it is possible to produce clothing without slave and child labour. On Apr. 27, 2015, two Bolivian children died in a sweatshop fire. “We started to receive a lot of phone calls from people who were indignant about what had happened, and concerned because we denounced many brand names of clothing for using sweatshops, and people asked us: so what are we supposed to wear?” said Tamara Rosenberg, the head of the cooperative. The very same clothing produced in sweatshops, which is sold at low prices in the city’s street markets, is sometimes sold by famous brand names at a higher mark-up. The Argentine network was inspired by the global Clean Clothes Campaign, whose aim is to improve working conditions in the global garment and sportswear industries. “The idea is to approach the sweatshops to raise awareness about the risks of not having their installations in proper working order, or of having children in the workshop, because the dust in the air hurts their respiratory system,” said Virasoro. The members of the network also give advice to designers “who want to do things in a responsible manner,” she said. Others are worried about reporting the situation because the police themselves often “tell the owner, who fires (the whistle-blower),” he said. Laura Méndez, who owns the Clara A brand name, decided to produce her accessories in the cooperative, after seeing “how they all worked crowded into a place with no exit” in a footwear factory, as well as other irregularities. 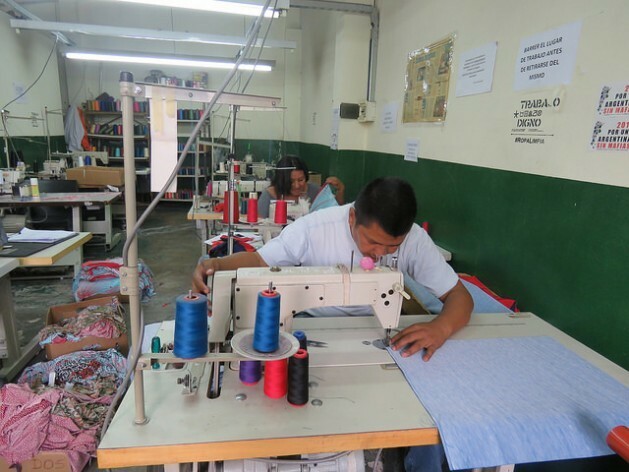 The 20 de Diciembre Cooperative employs 12 workers. María Reina’s story is dramatic, like those of many of her fellow workers. Six years ago, when she was travelling from Bolivia to Argentina, where she had been hired to work in a garment workshop, the bus rolled and in the accident her boyfriend and brother-in-law were killed, and she lost a leg. She is now undergoing rehabilitation. And she has learned that South American immigrants like her have labour rights, and have the right to an identity card and to free healthcare and education. “La Alameda has long been denouncing these practices by the sweatshops, which are also linked to other criminal activity,” said Rosenberg. “We’re even talking about organised crime because many of the brand names that outsource work to sweatshops have ties to other crimes like money laundering, drug trafficking, car smuggling, or ‘narco-brothels’,” she said. The challenge is to pass laws that guarantee inspections of the garment industry and the legal registration of private workshops. One alternative is the Polo Textil Barracas, which employs former sweatshop workers and uses machinery that in many cases had been confiscated.